In remembrance of 9/11, this walking tour guides you through the former World Trade Center in New York, where the tragic events of 9/11 took place. 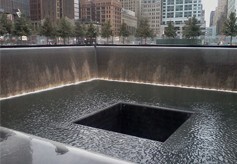 The tour is guided by New Yorkers who have a personal connection to 9/11. You will hear their personal stories and the touching stories of tragedy and heroism of many other everyday citizens. The tour will start at St. Paul's Chapel, the oldest public building in NYC still in continuous use. This church miraculously survived the falling building and debris from the 9/11 attacks despite it being only 1 block away. It became a makeshift rescue center during the aftermath and its iron fence became a bulletin board where family members posted notices of their missing loved ones. Today, with the mementoes received from people around the world supporting New York City, the church serves as a tribute. 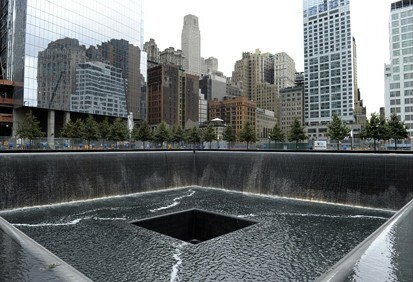 Next, hear the heroic stories of the emergency responders at the Firefighter's 9/11 Memorial Wall, and see the Engine and Ladder Company 10/10, the fire station at Ground Zero. Finally you'll enter the 9/11 Memorial, where you can pay your respects to those who lost their lives in the World Trade Center. 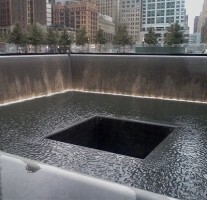 See the Reflecting Absence Memorial, the largest man-made waterfall inside the 9/11 Memorial, symbolizing the vast void left by the tragedy. Learn how the names of the nearly 3,000 victims are placed around the waterfall next to their friends, family members, colleagues. 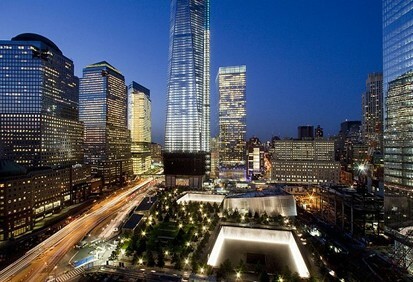 See the new Freedom Towers and World Trade Center rise from the ground. You can stay as long as you wish in this beautiful 8 acre green city oasis. *Note this tour does NOT include 9/11 Museum entry. 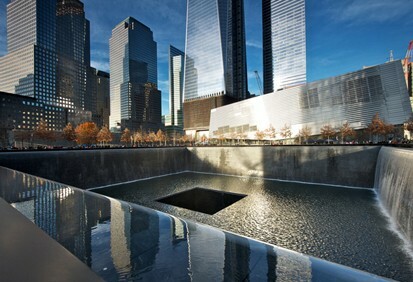 See our 9/11 Ground Zero Tour + 9/11 Museum Entry. Saint Paul's Chapel at 209 Broadway, between Fulton and Vesey Streets.